In the past at WCN we have written about Collecting various classic comedy stars and acts such as Chaplin, Laurel & Hardy etc. With the recent TCM Presents … There’s No Place Like Hollywood (November 2014) auction and on reading about the Robert Edward Auctions amazing Three Stooges posters sale (April 2015), and with 2015 being the 85th Anniversary of their first film Soup to Nuts (1930) we decided to investigate and create a feature on the Three Stooges themselves. 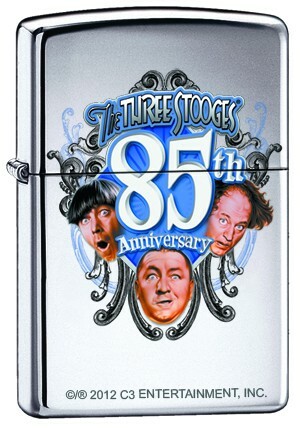 In this feature we have a brief look at who the Three Stooges were, take a look at some of the collectables available including some rarer and unusual items of memorabilia and ephemera. We also browse the official Three Stooges Store ‘knuckleheads’, and we check out the amazing prices being recorded for early Three Stooges trading cards. 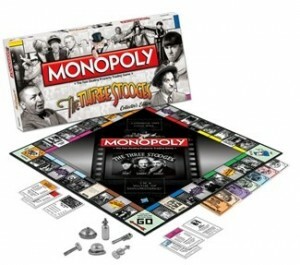 Pictured: The Three Stooges Monopoly – It’s time to wheel and deal with Curly, Larry and Mo, the kings of slapstick. Enjoy this classic game of risk taking and deal making as you compete to own memorable locations from the Three Stooges films. Laugh out loud as you buy Moronika and Mildew College; sell Rutentuten’s Tomb and the Los Arms Hospital; and trade Gypsum Goode Antiques and the Cannonball Express. Don’t be a “featherbrain imbecile” and go bankrupt! This hilarious trio is yours for the taking! “Step aside nitwit, I’ll show you how to do this.” Includes six collectible tokens: Derby hat, Mallet, Seltzer bottle, Pipe wrench, Cream pie and Violin. Slaps and eye pokes not included. “Woob, Woob, Woob!”. 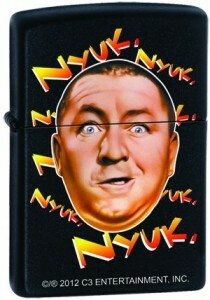 Available from knuckleheads.com. The Three Stooges were an American vaudeville and comedy act of the mid–20th century (1930–1975) best known for their numerous short subject films, still syndicated to television. Their hallmark was physical farce and slapstick. In films, the Stooges were commonly known by their first names: “Moe, Larry, and Curly” or “Moe, Larry, and Shemp”, among other lineups depending on the films; there were six active stooges, five of whom performed in the shorts. Moe and Larry were always present until the very last years of the ensemble’s forty-plus-year run. Pictured: A Three Stooges Pillsbury promotional poster 1937. U.S. promotional poster, linen-backed. 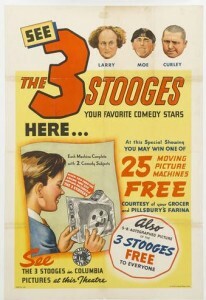 Advertising the Three Stooges Moving Picture Machine, a Pillsbury’s Farina cereal promotional item; also advertising the Stooges’ Columbia shorts. Provenance: Estate of Moe Howard; Collection of Joan Howard Maurer and Paul Howard. Literature: Reproduced in The Three Stooges Scrapbook by Jeff Lenburg, Joan Howard Maurer, and Greg Lenburg (Chicago: Chicago Review Press, 2012), p. 117. The first Three Stooges promotional item, a set of hand puppets, appeared on the market in 1935; this advertisement was printed two years later. The Moving Picture Machine was a cardboard projector accompanied by frames from Stooges’ movies which could be cranked through it. Participating theaters ran contests for these machines at Stooges’ matinees. 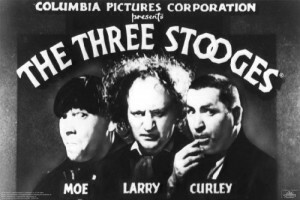 In 1937, the Three Stooges were at the height of their first wave of success at Columbia, producing such classics as Hoi Polloi, Three Little Beers, and Disorder in the Court. 27 x 41 in. Sold for US$ 4,000 (£2,636) at Bonhams, New York, 2014. Pictured: Heavenly Daze Columbia, 1948. Lobby card poster. 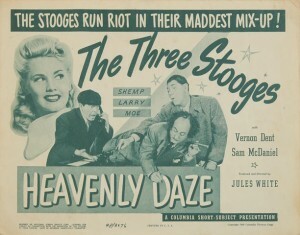 Duotone lobby card showing the classic trio at the office. In this short, Shemp has died but returns to Earth to teach the other Stooges a lesson and gain entry to Heaven. Provenance: Estate of Moe Howard; Collection of Joan Howard Maurer and Paul Howard. 14 x 11 in. Sold for US$ 937 (£617) at Bonhams, New York, 2014. 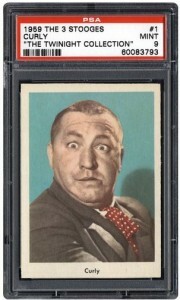 The 1959 Three Stooges Fleer card set will be of the highlights for a fan and collector of The Three Stooges. This set is also noted as the most popular non-sports trading card set. There were 96 cards in the set and it was released in 1959 just as the Stooges were beginning to appear regularly on TV. The 1959 Fleer cards feature scenes from the comedic trio’s short films shown in movie theaters from the 1930s through the 1950s. The 1959 Fleer Three Stooges set consists of 96 cards, each measuring 2-1/2” x 3-1/2”. Each card front bears a color drawing of the comedy trio – Moe, Larry, and Curly – individually or in a scene from one of their shorts. A thin border surrounds each stylish, horizontal image with a caption printed in black ink at the bottom border. Card backs have a humorous quotation that complements the comical adventure on the other side. Fleer published the cards on both a white and a gray cardstock, with the gray versions more difficult to find as most have deteriorated over the passing decades. However, the white versions are more sought-after due to their clean appearance. The scarcest individual cards are single print run variation that carried checklists on the revers (#16 “You Can’t Keep Your Money,” #63 “Curly The First Thing,” and #64 “You Won’t Fool Anybody”), with only slightly more than 200 total copies known to still exist. 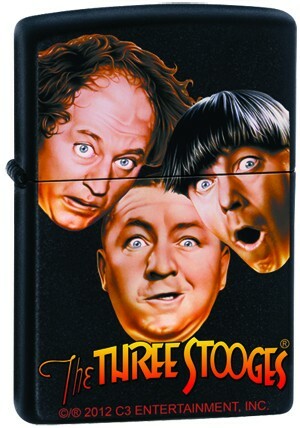 Not surprisingly, the other key cards in the set belong to the Stooges themselves – Curly (#1), Moe (#2), and Larry (#3) – with each vertical card consisting of a bust shot with biographical information on the reverse. Prime examples the card “Let Me Know When My Number Comes Up (#33) is difficult to find due to centering issues. The last card, “Trying the Squeeze Play (#96) is also tough to find in higher grades. Thanks to the continuing popularity of Moe, Larry, and Curly throughout the decades, 1959 Fleer Three Stooges set is regarded as one of the most coveted non-sport entry in the hobby, particularly in high grade. For the full Professional Sports Authentication article click here. Curly suffered a debilitating stroke in May 1946, and Shemp returned, reinstating the original lineup until Shemp’s death in November 1955. Film actor Joe Palma was used as a temporary stand-in; the maneuver thereafter became known as the term of art Fake Shemp—to complete four Shemp-era shorts under contract. The coining of the term took place before a new contract from Columbia but after comic Joe Besser joined as the third Stooge in a run in ’56–57—but he left in 1958 to nurse his ailing spouse. Columbia terminated its shorts division and released its Stooges contractual rights to the Screen Gems production studio. When Screen Gems syndicated the shorts to television, the Stooges became one of the most popular comedy act of the early 1960s. They also made a cameo appearance in the 1963 comedy classic It’s a Mad Mad Mad Mad World. Pictured: A Moe Howard owned screenplay of the final Three Stooges film, The Outlaws IS Coming! Columbia, 1965. 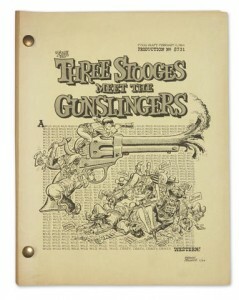 Final draft screenplay by Elwood Ullman, 118 pp, Hollywood, February 3, 1964, bound in brads with yellow cover featuring the film’s original title, The Three Stooges Meet the Gunslingers, and an illustration by Norman Maurer. Provenance: Estate of Moe Howard; Collection of Joan Howard Maurer and Paul Howard. Released in 1965, The Outlaws IS Coming! was the Stooges’ final theatrical film. Its title was a play on the tag line for Alfred Hitchcock’s The Birds (“The Birds Is Coming”) and it featured the trio investigating a Wild West plot to wipe out the buffalo population. 8 1/2 x 11 in. Sold for US$ 1,750 (£1,153) at Bonhams, New York, 2014. Comic actor Joe DeRita became “Curly Joe” in 1958, replacing Besser. With the television exposure, the act regained momentum throughout the 1960s as popular kiddie fare until Larry Fine’s paralyzing stroke in January 1970. Fine died in 1975 after a further series of strokes. Moe tried one final time to revive the Stooges with longtime supporting actor Emil Sitka in Larry’s role but this attempt was cut short with Moe’s death in May 1975.